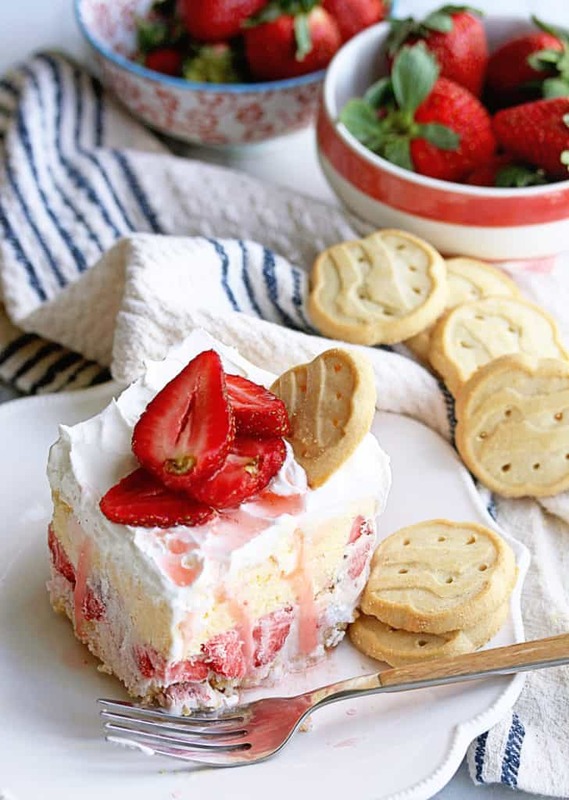 This Strawberry Ice Cream Cake using Girl Scout Cookie Trefoils takes Strawberry Short Cake to the next level. Easy and soooo good! I have a slight obsession with Strawberry Short Cake. This is why I knew I was going to make an ice cream cake using Girl Scout Cookies that gave me the same joy the original did. Using Trefoils was a brilliant way to make this happen. It tastes like the most incredible shortbread cookie you have ever devoured. It is quite a match for mascerated strawberries, whipped cream and strawberry and vanilla ice creams. And if you want to take things even further, you can make the ice cream from scratch. Click HERE for my delicious Homemade Strawberry Ice Cream recipe and click HERE for my insane Homemade Vanilla Ice Cream recipe. This recipe is a snap to make, and doesn’t really require a recipe. I have a guideline below that you can use to make yours but remember, this is all about fun. You don’t need to follow the rules with this ice cream cake. As long as you are having a blast in the kitchen with your kids and Girl Scouts, you are making a winner in my book. Make sure you check out the fun video I did with the Girl Scouts of Great Chicago and Northwest Indiana below and HERE! 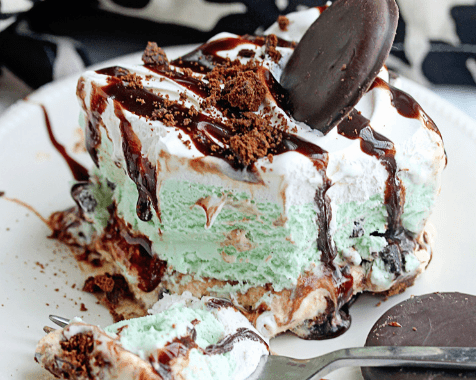 And for my Girl Scout Cookies Mint Chocolate Ice Cream Cake, click HERE! 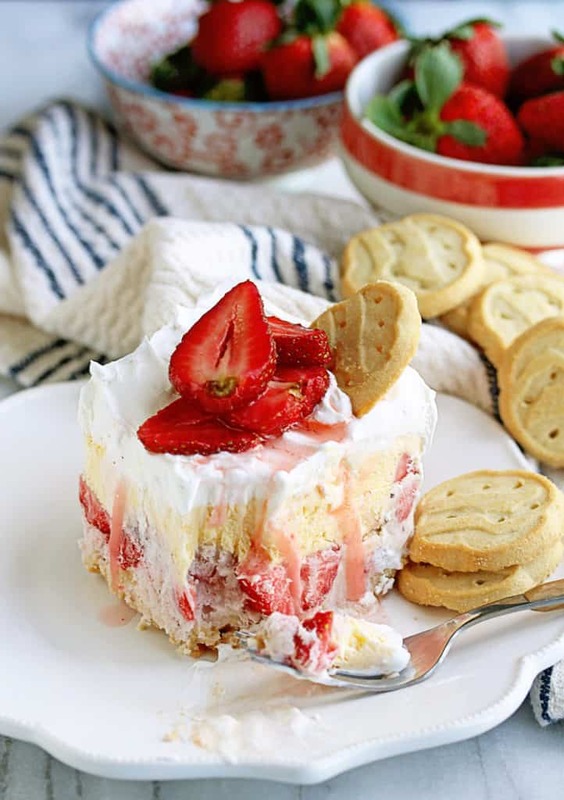 This Girl Scout Cookies Strawberry Ice Cream Cake made with Trefoils takes Strawberry Short Cake to the next level. Easy and soooo good! Line the outside of a 9 inch round baking pan (or springform pan or pie plate) with plastic wrap. Begin creating layers inside the pan. 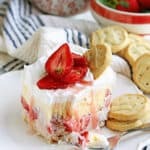 You can start with strawberry ice cream smoothing with a spatula until smooth then freeze for 45 minutes then layer with crushed cookies and strawberries then layer with vanilla ice cream, and whipped topping. Top decoratively with remaining strawberries and remaining trefoil cookies and freeze overnight or for at least 8 hours then cut and serve. These photos are just delicious! Yum! So crave-able and so stunning! What an easy peasy way to get a nice dose of berries, ice cream and Girl Scout cookies!!! Win-Win-Win!!!! J, oh my gawd, I love this cake!!!! and the VIDEO! those girls were so cute! I’m signing Phoebe up for the girl scouts so I love this post!!!!!! Oh she will love it and have a blast!!! Get ready to sell tons of cookies! i need to find Trefoils…stat! this looks amazing!!! YES you do! Thanks so much! Beautiful and delicious. Trefoils are my favorites, I can eat the whole box all by myself. I am so all over this!! What a fabulous way to showcase Trefoils! Yum!